In medium bowl, toss spinach and pesto. In another bowl, mix Alfredo sauce and broth. Spoon one-third of sauce mixture (about 1/2 cup) into baking dish. Top with half of spinach mixture. Arrange half of ravioli in single layer over spinach mixture. Repeat layers. Top with remaining sauce mixture. Bake uncovered 30 minutes. Sprinkle with cheese. Bake 5 minutes longer or until bubbly. Garnish with basil and paprika. Although this dish calls for frozen ravioli, you can let the ravioli sit on the countertop about 5 minutes before preparing the recipe to allow the frozen ravioli to separate more easily. An easy way to add veggies to your dinner is to add leafy greens to your favorite pasta. Spinach wilts quickly and shrinks quite a bit, so you won’t feel like you’re eating as much healthy greens as you are. Using ravioli to make a lasagna is one of the most efficient ways to get the job done, because the cheese is already contained in every delicious bite! 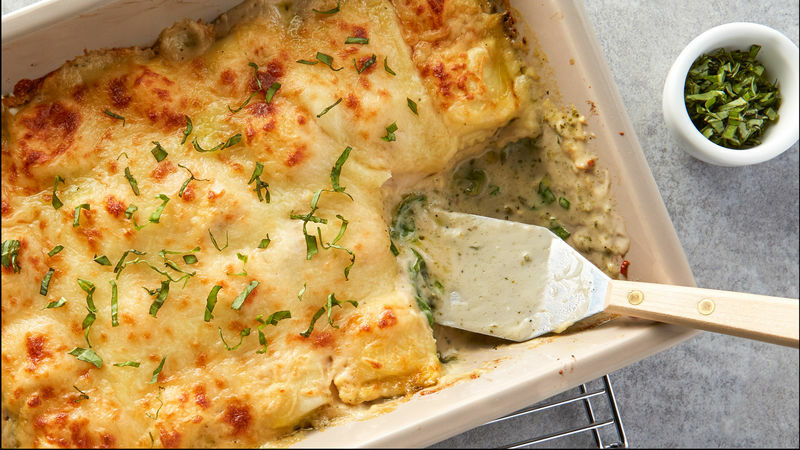 This spinach ravioli bake combines cheesy Alfredo sauce, cheese-filled ravioli and shredded Italian cheese blend for a triple-cheese dinner — complete with a green vegetable — the whole family will enjoy. Want to know how to buy, store and cook pasta? Betty’s got you covered, as always!